What is the city? One of the possible ways to define the urban world is through the presence of architecture. In this series of conversations, the creators of Q9 magazine will explain to us, individually, a building in Barcelona: that one that for one reason or an other, has always captured their attention. Every conversation with these young experts in architecture will help us to reflect on the perception, the experience and the cohabitation that people have with these works of art in which one can live. You are currently completing the fourth year of your architecture studies. Yes, I still have the fifth year and final project ahead. What area of architecture is interesting you the most? I tend to pay more attention in the theory, not so much in the construction itself, but in everything that is related to the history or the divulgation. I am very interested in the way in which architecture can be explained. You all sort of do everything at the Q9 magazine, but in particular, you also are responsible for the book section. Exactly, I search for works that can help complete the things that students are learning in college. Architecture has two different sides: the one that is based on the technique and then, on the other hand, the cultural, artistic and humanistic side. I think architecture students tend to focus more on technique and often don’t give enough value to more theoretical subjects such as History or Art. I like to reclaim them through the selection of books in Q9 magazine. 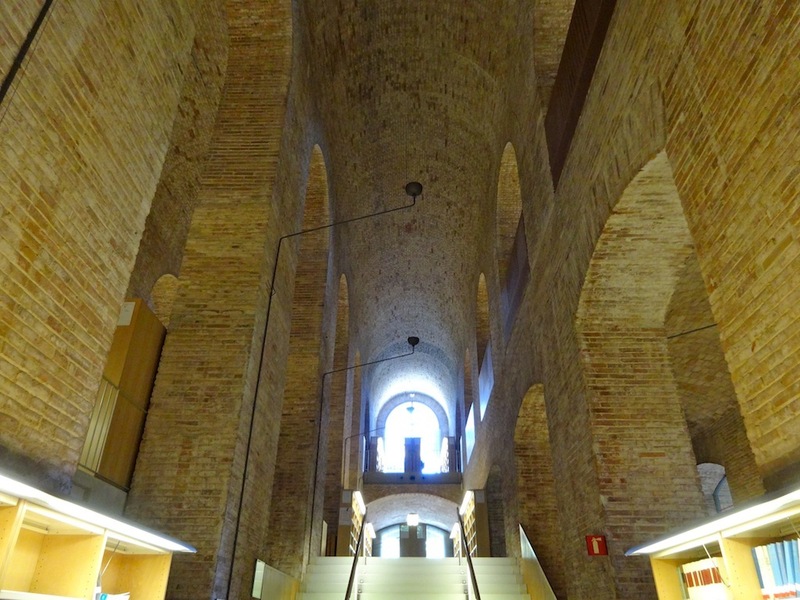 And precisely now we find our selves in this building called Dipòsit de les Aigües (it means ‘the waters tank’ in Catalan) that is the library at the Ciutadella Campus of the Pompeu Fabra University. Why have you chosen this building? Well, I’ve always loved libraries; I have the habit of going there to study because in my house there is always a lot of movement. I live in the Maresme (a region in the North of Barcelona’s metropolitan area) and there, it is not easy to find a library with broad opening times, so one day I discovered this one. I remember the first time I came here, it was during the exam period: it opened at 9 am and there was a long queue of students waiting to enter. When the doors finally opened, everyone rushed inside pushing around in order to get a table. Yes, it felt like the first day of the sales! And my first impression of this place was very special because you can’t access this building directly, the entry is placed in a way that forces you to take a tour around other parts of the Campus: you have to enter the Jaume I building, cross an open space, pass an underground passageway, climb a modern staircase and suddenly, you enter in this old tank which is very different from everything you’ve just seen on this previous tour, you don’t expect something like this at all. A dramatic effect, almost theatrical. You are more interested in the overall space and its atmosphere rather than just in a particular item of it? This is correct. Although, these arcades have always fascinated me, they remind me of those in the Roman aqueducts. In fact, the name of the building already shows a clear relationship with water. This is a key feature for understanding this structure, as its name suggests, it is a large water tank. 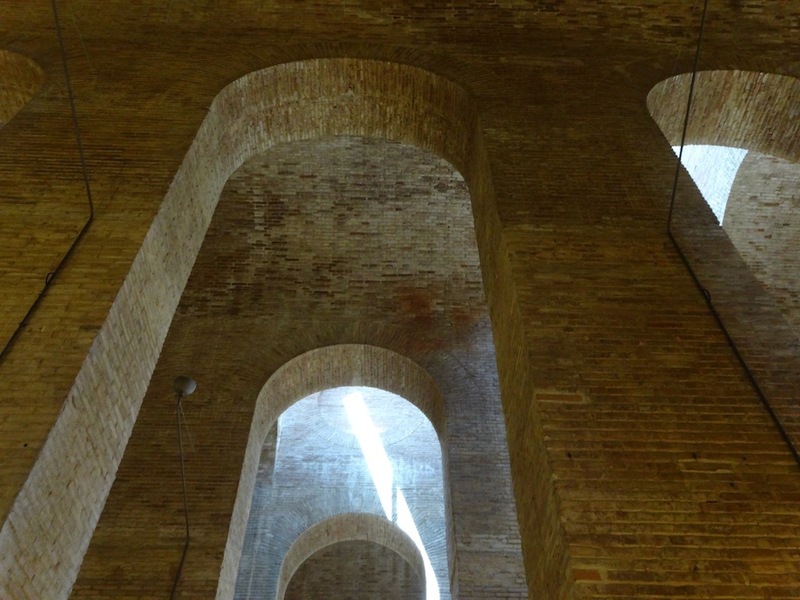 The project is by the master builder Josep Fontserè, the same one who built the Born Market. In 1874 he was made responsible for the development of the Ciutadella Park that had to be ready for the Universal Exhibition of 1888. At that time, the young architect Antoni Gaudí was one of his collaborators, and in fact, it was he who did all the calculations to make sure the support points of the tank could hold the weight of the water that is collected from rain in this huge square pool elevated at 14 meters of height. There are many works of Gaudí that we do not know of and this is one of them. It was through this project that he passed his architecture studies. The water that went to the near by Ciutadella Park came from here. Yes, from here it went to the waterfall, which was also designed by Fontserè. Then it was collected in the artificial lake where little boats are. From there, it is unclear whether this water was being pumped back and up to the tank forming a closed loop or diverted somewhere else. So originally, a place where today we find so much poetry, was just purely functional. More than an actual building, it was an infrastructure. If we look at its style, we can say that it is an industrial style of the time. Although there are influences of Roman architecture as noted earlier. For over 100 years, the space beneath the tank, where now all tables and books are, had several uses, but none was definitive. It can be said then that the building has inverted its useful space: during the first century, there was a lot of empty space for a long time under the roof that contained water. Now, this space is the one that is used, but if I’m not mistaken, the roof no longer fulfils its function of a deposit. 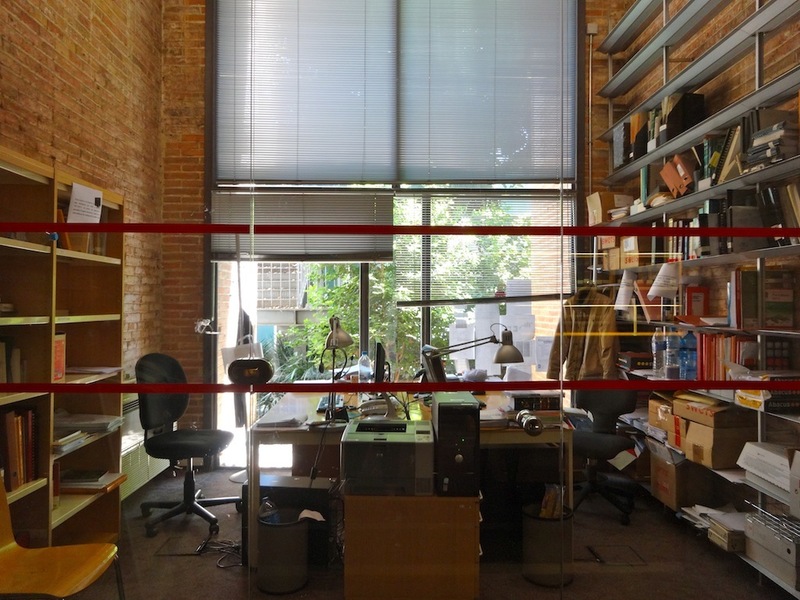 No, because it ended up being emptied because after the 1999 reforms, signed by architects Lluís Clotet and Ignacio Aparicio: skylights were opened to provide more natural light and the weight-bearing capacity of the structure got significantly reduced. Now, the water from the waterfall of the Ciutadella Park comes from a different source. 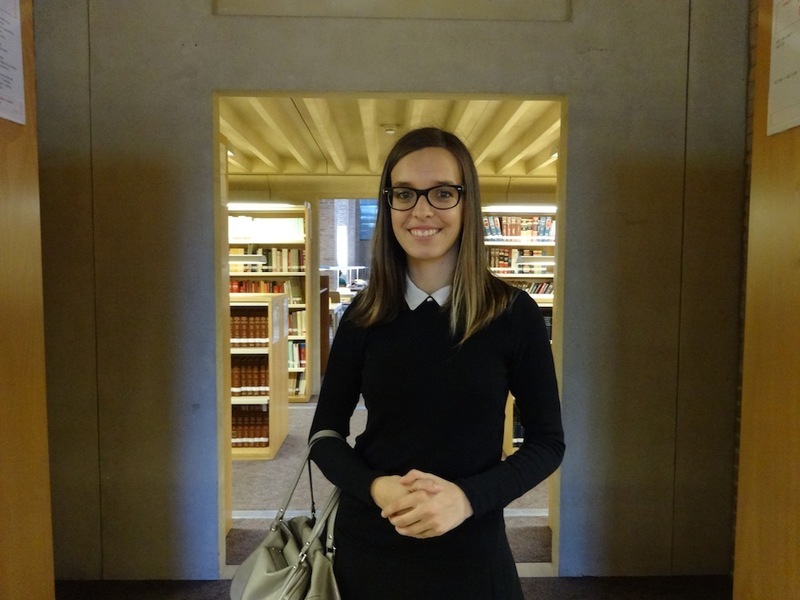 It is very interesting to see, through the building, how the city has generated demand for very different services: going from a water tank to a university library. It is also nice the fact of having reused and reinvented an existing space. This library is full of charm and mystery that probably wouldn’t be there if the building had been created specifically as a library. Why do you think this is so? I mean, why do you suggest that there can be more charm in a renovated old building rather than in one that is newly built for a specific purpose? This always depends on each case. I do not mean that a new building could not have charm, but it is true that, in recent decades, the construction parameters have changed a lot, especially when compared with those that existed at the time of Gaudí. To begin with, workers were actual craftsmen and every window or every brick you see here was created following a traditional process, this can be perceived. Today everything is manufactured in series, but before, it was common that each piece was unique. Also, sponsorship and investment in art and culture were much more common than today. This trend is very complex and I have only defined it here broadly, but it is present in all aspects of society and architecture is one of them, that is why I am more interested in the theoretical part of it. Meet Q9 Magazine and its other members Barcelonogy recently talked too: Miguel Angel Aguiló and Pep Quilez. ¿Qué es la ciudad? Una de las posibles maneras de definir el mundo urbano es mediante la presencia de arquitectura. En esta serie de conversaciones, los creadores de la revista Q9 nos destacan, de manera individual, un edificio barcelonés: el que por un motivo u otro, siempre les ha llamado la atención. Cada conversación con estos jóvenes expertos en arquitectura, nos ayudará a reflexionar sobre la percepción, la experiencia y la convivencia que los ciudadanos mantenemos con estas obras de arte dentro de las cuales se puede vivir. Estás estudiando cuarto de arquitectura. Sí, me queda quinto y el proyecto final. ¿Qué área de la arquitectura te está interesando más? Tengo tendencia a fijarme más en la parte de teoría, no tanto en la construcción en sí, sino en todo lo relacionado con la historia o la divulgación. Me interesa mucho cómo se explica la arquitectura. Todos hacéis de todo en la Q9, pero particularmente también eres la encargada de la sección de libros. Exacto, me dedico a buscar obras que ayuden a completar todo lo que se está aprendiendo en la universidad. La arquitectura tiene dos lados muy claros que son la parte técnica y luego todo lo relacionado con su aspecto cultural, artístico y humanístico. Creo que a menudo los estudiantes de arquitectura se focalizan mucho en la técnica y no valoran suficientemente las asignaturas más teóricas como por ejemplo la historia o el arte. Me gusta reivindicarlos a través de los libros. 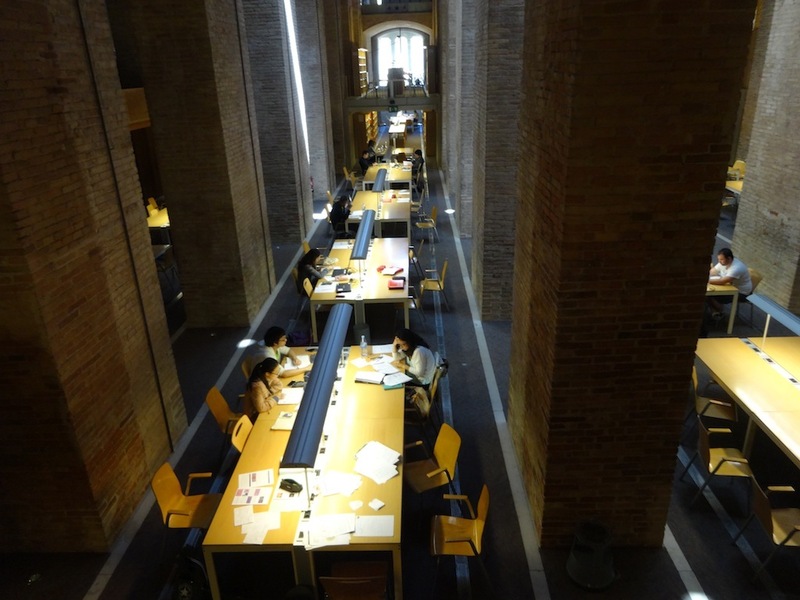 Y justamente hoy estamos en el Depósito de las Aguas que es la Biblioteca del Campus de Ciutadella de la Universidad Pompeu Fabra. ¿Por qué has elegido este edificio? Bueno, siempre me han encantado las bibliotecas, tengo la costumbre de estudiar en ellas porque en mi casa siempre hay mucho movimiento. Vivo en la zona del Maresme y allí no es fácil encontrar bibliotecas que tengan un horario amplio, así que un día descubrí ésta. Recuerdo la primera vez que vine, en plena época de exámenes: abrían a las 9 de la mañana y había una cola muy larga de estudiantes esperando para entrar. Cuando finalmente se abrieron las puertas, todos se lanzaron a su interior corriendo y dando empujones para conseguir una mesa. Sí, ¡parecía el primer día de rebajas! Y la primera impresión que me dio este espacio fue muy especial porque no se entra directamente por éste, su acceso está dispuesto de una manera que te obliga a hacer una recorrido por otras zonas del Campus: entras por el edificio de Jaume I, pasas por un espacio exterior, un pasillo subterráneo, unas escaleras modernas y de repente, entras en el Depósito que es un entorno muy diferente a todo lo que has encontrado en este recorrido previo y que no te esperas en absoluto. Un golpe de efecto, casi teatral. ¿Te interesa más el espacio en su conjunto y su atmósfera más que algún elemento en particular? Correcto. Aunque estas arcadas siempre me han fascinado, me recuerdan a las que sustentan los acueductos romanos. De hecho, el nombre del edificio ya indica una clara relación con el agua. Esto es un rasgo fundamental para entender esta estructura que, como su nombre indica, es un gran depósito de aguas. El proyecto es del maestro de obras Josep Fontserè, el mismo que construyó el Mercado del Born, y que en 1874 se encargó de la urbanización del Parque de la Ciutadella que debía estar listo para la exposición Universal de 1888. En ese momento, el joven arquitecto Antoni Gaudí era uno de sus colaboradores y, de hecho, fue él quien hizo los cálculos para que los puntos de apoyo del depósito pudieran sostener todo el peso del agua que se recogía de la lluvia en esta especie de enorme piscina de planta cuadrada elevada a 14 metros de altura. Hay muchos trabajos de Gaudí que no conocemos y éste es uno de ellos. Fue gracias a este proyecto que aprobó la carrera de arquitectura. El agua que iba parar al Parque de la Ciutadella venía de aquí. Sí, de aquí se canalizaba hasta la cascada, que también estaba proyectada por Fontserè. Después se recogía en el estanque artificial donde están las barcas de remo. A partir de ahí, no está claro si el agua volvía siendo bombeada hasta depósito formando un circuito cerrado o si se desviaba hacia otra dirección. Así que en su origen, un espacio donde hoy encontramos tanta poesía, sólo tenía un carácter puramente funcional. Más que un edificio en sí, el depósito de las Aguas era una infraestructura. Si miramos cuál es su estilo, podemos decir que es un estilo industrial de la época. Aunque también están las influencias de arquitectura romana tal y como hemos apuntado antes. Durante más de 100 años todo el espacio que hay debajo del depósito, donde ahora están las mesas y los libros, tuvo varios usos, pero ninguno definitivo. Se puede decir que el edificio ha invertido su espacio útil: durante su primer siglo, su tejado contenía agua y debajo, hubo mucho espacio vacío durante mucho tiempo. Ahora se usa la parte inferior, pero si no me equivoco, el tejado ya no cumple su función de depósito. No, se acabó vaciando porque durante la reforma de 1999 realizada por los arquitectos Ignacio Aparicio y Lluís Clotet, se abrieron tragaluces para que hubiera más luz natural y éstas restaron la capacidad de aguantar el peso de la estructura. Ahora el agua de la cascada de la Ciutadella proviene de otro origen. Es muy interesante ver, a través de este edificio, como la ciudad ha ido generando demanda por servicios tan diferentes: de depósito de aguas a una biblioteca universitaria. También es muy bonito, el hecho de que se haya reaprovechado y reinventado un espacio ya existente. Esta biblioteca está llena de un encanto y de un misterio que no tendría si el edificio hubiera sido creado expresamente para esta función. ¿Por qué crees que esto es así? 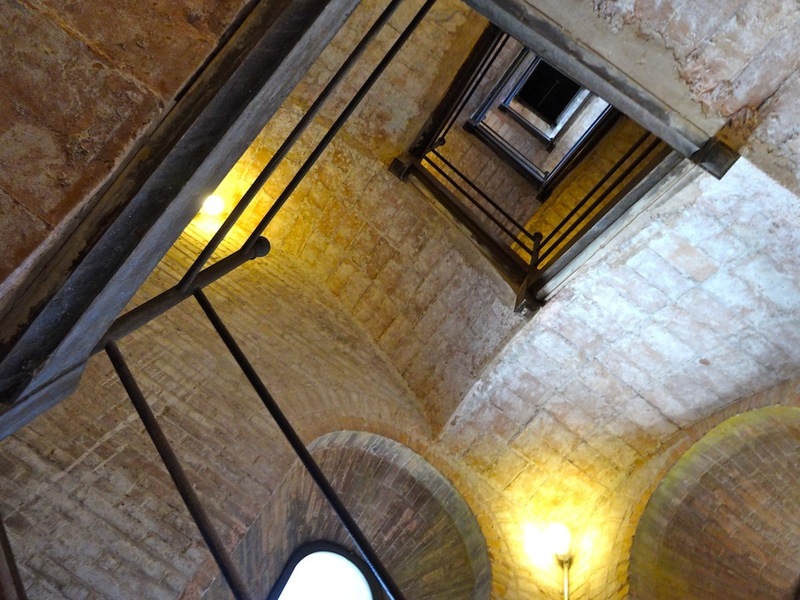 Es decir, ¿por qué podemos encontrar más encanto en un edificio antiguo y renovado que en uno construido expresamente para la función que debe servir? Esto siempre es muy relativo y no quiero decir que un edificio nuevo no podría tener encanto, pero si es cierto que en las últimas décadas, los parámetros de construcción han cambiado mucho, especialmente si los comparamos con los que había en la época de Gaudí. Para empezar, los obreros eran artesanos y cada ventana o cada ladrillo que ves aquí ha sido creado mediante un proceso artesanal, esto se percibe. Ahora todo se fabrica en serie, pero antes era mucho más habitual crear cada pieza de forma única. También, el mecenazgo y la inversión en arte o en cultura eran mucho más habituales que hoy. Esta tendencia es muy compleja y aquí sólo la he definido a grandes rasgos, pero se traduce en todos los aspectos de la sociedad, y la arquitectura es uno de ellos, por eso me interesa tanto la parte teórica de la misma. No te pierdas Q9Magazine y las conversaciones que Barcelonogy ya ha tenido con Miguel Angel Aguiló y Pep Quilez. Què és la ciutat? Una de les possibles maneres de definir el món urbà és mitjançant la presència d’arquitectura. En aquesta sèrie de converses, els creadors de la revista Q9 ens destaquen, de manera individual, un edifici barceloní: aquell que per un motiu o altre, sempre els hi ha cridat l’atenció. Cada conversa amb aquests joves experts en arquitectura, ens ajudarà a reflexionar sobre la percepció, l’experiència i la convivència que els ciutadans mantenim amb aquestes obres d’art dins de les quals s’hi pot viure. Em trobo amb la Maria Torrellas (Argentona, 1990), editora i coordinadora de la secció de llibres de la revista Q9 Magazine, al Dipòsit de les Aigües del campus de la Ciutadella de la Universitat Pompeu Fabra. Sí, em queda cinquè i el projecte final. Quina àrea de l’arquitectura t’està interessant més? Tinc tendència a fixar-me més en la part de teoria, no tant en la de construcció en si, sinó en tot el que està relacionat amb la història o la divulgació. M’interessa molt com s’explica l’arquitectura. Tots feu de tot a la Q9, però particularment també ets l’encarregada de la secció de llibres. Exacte, em dedico a buscar obres que ajudin a completar tot allò que s’està aprenent a la universitat. L’arquitectura té dues vessants molt clares, que són la tècnica i després tota la part cultural, artística i humanística. Crec que, sovint, els estudiants d’arquitectura es focalitzen molt en la part tècnica i no valoren prou les assignatures més teòriques, com per exemple la història o l’art. M’agrada reivindicar-les a través dels llibres. 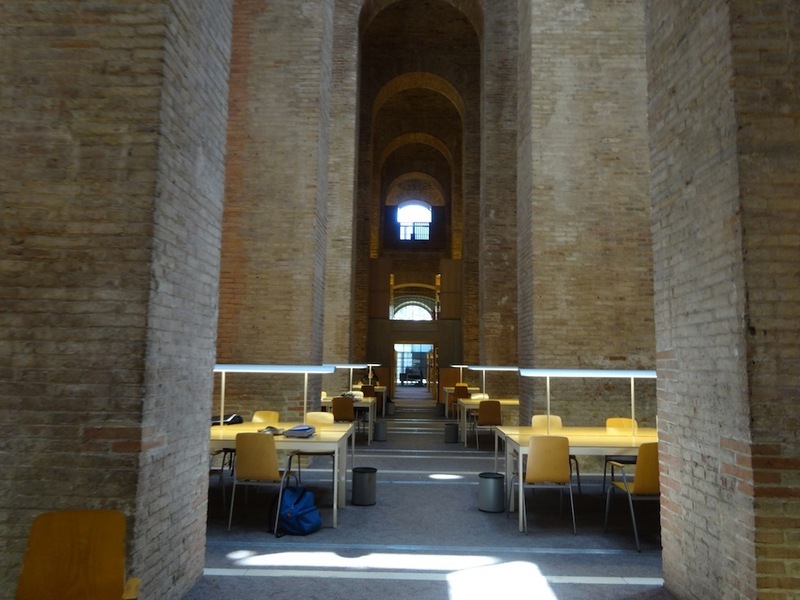 I justament avui som al Dipòsit de les Aigües, que és la biblioteca del campus de la Ciutadella de la Universitat Pompeu Fabra. Per què has escollit aquest edifici? Bé, sempre m’han encantat les biblioteques, tinc el costum d’anar-hi a estudiar perquè a casa meva sempre hi ha molt d’enrenou. Visc al Maresme i allà no és fàcil trobar biblioteques que tinguin un horari ampli, així que un dia vaig descobrir aquesta. Recordo la primera vegada que vaig venir, en plena època d’exàmens: obrien a les nou del matí i hi havia una cua molt llarga d’estudiants esperant per entrar. Quan finalment es van obrir les portes, tots es van llançar a córrer i empènyer per agafar taula. Sí, semblava el primer dia de les rebaixes! I la primera impressió que em va donar l’espai va ser especial, perquè no s’entra directament per aquest edifici, sinó per un accés que està disposat d’una manera que t’obliga a fer un recorregut per altres zones del campus: entres per l’edifici Jaume I, passes per un espai exterior, un passadís subterrani, unes escales modernes i, de sobte, entres al Dipòsit, que és un entorn molt diferent de tot el que has trobat en aquest recorregut previ i que no t’esperes en absolut. Un cop d’efecte, gairebé teatral. T’interessa més l’espai, en el seu conjunt i la seva atmosfera, que no pas algun element en particular? Correcte. Malgrat que aquestes arcades sempre m’han fascinat, em recorden les que sustenten els aqüeductes romans. De fet, el nom de l’edifici ja indica una clara relació amb l’aigua. Això és un tret fonamental per entendre aquesta estructura que, com el seu nom assenyala, és un gran dipòsit d’aigües. 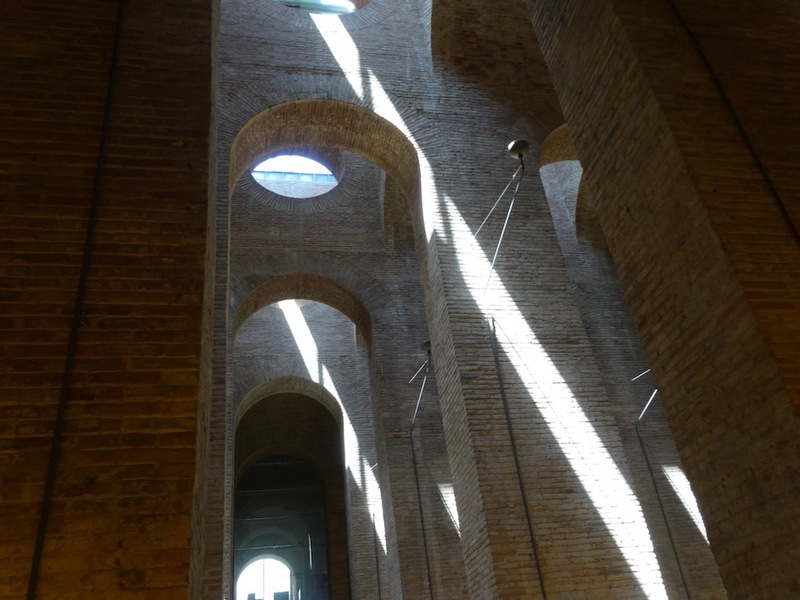 El projecte és del mestre d’obres Josep Fontserè, el mateix que va construir el mercat del Born, i a qui l’any 1874 es va encarregar la urbanització del parc de la Ciutadella, que havia d’estar enllestida per a l’Exposició Universal del 1888. En aquell moment, el jove arquitecte Antoni Gaudí era un dels seus col·laboradors i, de fet, va ser ell el que va fer els càlculs perquè el punts de suport del dipòsit poguessin sostenir tot el pes de l’aigua que es recollia de la pluja en aquesta mena d’enorme piscina de planta quadrada, elevada a catorze metres d’alçada. Hi ha molts treballs de Gaudí que no coneixem i aquest és un d’ells. Va ser gràcies a aquest projecte que Gaudí va aprovar la carrera d’arquitectura. L’aigua que havia d’anar a parar al parc de la Ciutadella venia d’aquí. Sí, i es canalitzava fins a la cascada, que també estava projectada per Fontserè. Després es recollia en l’estany artificial on hi ha les barques. A partir d’aquí, no queda clar si l’aigua tornava sent bombejada fins al dipòsit, formant un circuit tancat, o si es desviava cap a una altra direcció. Així que, en el seu origen, un espai on avui hi trobem tanta poesia, només tenia un caràcter purament funcional. Més que un edifici, el Dipòsit de les Aigües era una infraestructura. Si mirem quin és el seu estil, podem dir que és un estil industrial de l’època. Malgrat que també hi ha les influències de l’arquitectura romana, tal com ja hem apuntat abans. Durant més de cent anys tot l’espai que hi ha a sota del Dipòsit, on ara estan les taules i els llibres, va tenir diversos usos, però cap de definitiu. Es pot dir que l’edifici ha invertit el seu espai útil: durant el seu primer segle, la teulada contenia aigua i a sota hi va haver molt d’espai buit durant molt de temps. Ara es fa servir la part inferior però, si no m’equivoco, la teulada ja no compleix la seva funció de dipòsit. No, es va acabar buidant perquè durant la reforma de l’any 1999, signada pels arquitectes Ignacio Aparicio i Lluís Clotet, es van obrir lluernes perquè hi entrés més llum natural, i aquestes van restar la capacitat d’aguantar pes de l’estructura. Ara, l’aigua de la cascada de la Ciutadella prové d’un altre lloc. 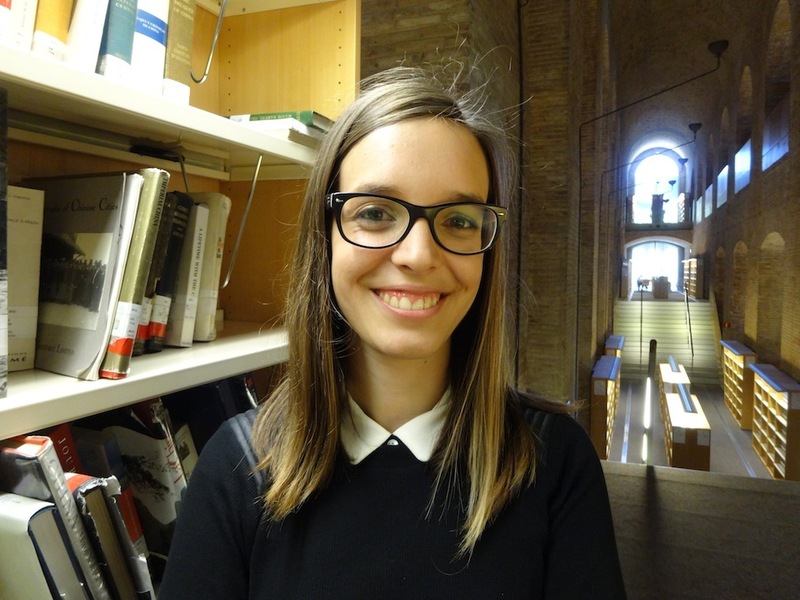 És molt interessant veure, a través d’aquest edifici, com la ciutat ha anat generant demanda per a serveis ben diferents; així, hem passat d’un dipòsit d’aigua a una biblioteca universitària. També és molt maco el fet de que s’hagi reaprofitat i reinventat un espai ja existent. Aquesta biblioteca és plena d’un encant i d’un misteri que no tindria si l’edifici s’hagués creat expressament per a aquesta funció. Per què creus que això és així? És a dir, per què podem trobar més encant en un edifici antic i renovat que no pas en un de construït expressament per a la funció que ha de fer? Això sempre és molt relatiu i no vull dir que un edifici nou no pugui tenir encant, però sí que és cert que, en les darreres dècades, els paràmetres de construcció han canviat molt, especialment si els comparem amb aquells que hi havia en l’època de Gaudí. Per començar, els obrers eren artesans, i cada finestra o cada totxo que veus aquí han estat creats mitjançant un procés artesanal; això es percep. Ara tot es fabrica en sèrie, però abans era molt més habitual crear cada peça de manera única. També, el mecenatge i la inversió en art o en cultura eren molt més habituals que avui. Aquesta tendència és molt complexa i aquí només l’he definida a grans trets, però es tradueix en tots els aspectes de la societat, i l’arquitectura és un d’ells. Per això m’interessa tant la part teòrica d’aquesta. No us perdeu Q9 Magazine i les altres converses que Barcelonogy ha tingut amb: Miguel Angel Aguiló i Pep Quilez.